Why Truck Body Fittings Roll up door van body? 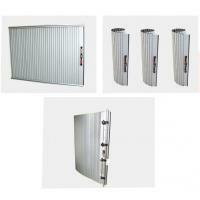 Durable yet lightweight slat design with weather seal between each slat. There are three side rails available. The standard rail has a finish flange on the outside. There is also a flange on the inside to mount the rail but not through the area where the door rides. The recessed rail has no finish flange and is mounted by putting the screws through a recessed area in the rail where the door rides. This recessed area hides the screw so there is no interference with the door. The universal rail looks much the same as the standard rail, but can also be mounted onto the front face of the compartment. A Santoprene seal is provided to hide the screw heads. Any of the side rails can be predrilled to the customers specifications free of charge. All the flexible polymer components such as the wipers and seals are made of Santoprene. It has a high resistance to UV's and adjusts well to hot and cold extremes. It also cleans very easily with mild detergents. The top of each handle is supplied with a heavy duty rubber bumper to dampen noise and vibration.